Product prices and availability are accurate as of 2019-04-07 16:31:39 UTC and are subject to change. Any price and availability information displayed on http://www.amazon.com/ at the time of purchase will apply to the purchase of this product. Nighty Night is a 100% KidSafe synergy blend that's main purpose is to create an overall calming atmosphere to help lure kids to a restless slumber. 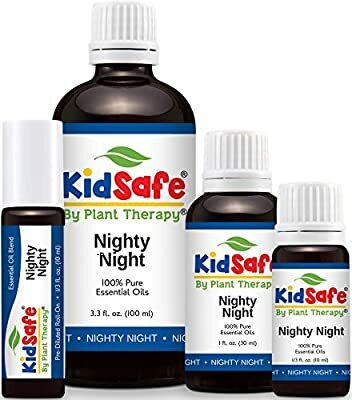 Each of the pure KidSafe essential oils that make up the Nighty Night synergy blend, was carefully chosen to not only be safe, but effective when trying to create an atmosphere that is ideal for children to fall asleep. The blend is tranquil, warming, balancing, relaxing, and supports clear respiration, which is the perfect formula to calm little ones to help them fall asleep and stay asleep. Whether used topically, in a warm bedtime bath, or diffused 30 minutes before bed, each parent will greatly appreciate the help that Nighty Night adds to bedtime routines. 100% KIDSAFE: The ONLY KidSafe essential oil line specifically formulated (by Robert Tisserand) for children ages 2-10. THE HIGHEST QUALITY: Contains 100% pure, undiluted, KidSafe essential oils of: Lavender, Marjoram, Cedarwood Atlas, Patchouli, Clary Sage, Chamomile Roman, Blue Tansy. EASY TO USE: Apply topically to your child's chest or back of the neck at a 2% dilution using your favorite carrier oil 30 minutes before bedtime. Add 3 drops to ½ cup of Epsom salt, and 3 Tablespoons of carrier oil and add to a warm, nighttime bath. Diffuse throughout the night 30 minutes on and 30 minutes off. PROMOTES A PEACEFUL NIGHT: Nighty Night is formulated to address all common barriers to a deep, peaceful night of sleep for your little ones. HAVE QUESTIONS? Plant Therapy's certified aromatherapists are happy to help you with your KidSafe Nighty Night questions via Amazon Messages. We welcome your questions and input!